It is a real pleasure for me to join you at the Chinese New Year Reception. Since I came to London, First Minister Jones has hosted a Chinese New Year reception for three consecutive years. Every time he has graciously invited me. This is a telling example of how much the Welsh government and First Minister Jones set store by relations with China. I appreciate his kindness. Yet to my regret, due to scheduling reasons, I could not come in the previous two years. Instead I sent senior diplomats from the Chinese Embassy on my behalf. As an old saying goes, this is third time lucky! So, this year it is my honour to accept the invitation of First Minister Jones. According to the Chinese calendar, the year of the Snake is only two days from us. In Chinese culture the snake symbolizes longevity, prosperity and wealth. I want to wish you good health, best luck and a prosperous year of the Snake! This is my first attendance at Chinese New Year celebration in Wales. But, this is already my fifth visit to Wales. · His Royal Highness Prince Charles and I jointly unveiled the Confucius Classroom in Llandrovery College. · I gave a speech in Cardiff University and addressed a business luncheon in Cardiff. · I visited some pharmaceutical and environmental protection companies in Wales. · I watched the world-renowned Ryder Cup games here in Wales at the invitation of First Minister Jones. Each time here in Wales I have felt at home. This is not only because of your beautiful nature and hospitable people, but also because we share the icon of dragon! Our national character and culture also have a lot in common! Chinese New Year, also known as the Spring Festival, is the most important traditional festival in China. It is a time when people review the past year and make wishes for the coming year. I am glad that now it is also celebrated by many Welsh people. As we look back on 2012, we better appreciate its significance for China. It was a special year for many reasons. The Chinese economy achieved growth while maintaining stability. In addition, the quality of Chinese people’s life continued to improve. This progress will continue as China follows the blueprint drawn up late last year at the 18th National Congress of the Communist Party of China. This Congress elected a new leadership for China. These new leaders will have the responsibility of implementing the ‘blueprint’ for China’s future development and set out the goals of building China. In China we describe the aims as creating a well-off society and deepening reform and opening up. China is getting close to what is being described as the ‘China Dream’ of revitalising the Chinese nation. 2012 also marked the 40th anniversary of full diplomatic relations between China and UK. Over the past four decades, China-UK relations have advanced steadily. Our cooperation in economy, science and technology, education, culture and tourism has been fruitful. China and UK are two major countries of global influence; this means that a sound China-UK relationship not only benefits our two peoples but also contributes to world peace and prosperity. The experience of China-UK relations in the past 40 years shows that only when we respect each other and treat each other as equals can our relations keep moving forward. In turn respect leads to cooperation broadening and friendship deepening. Local exchanges are part and parcel of China-UK relations. 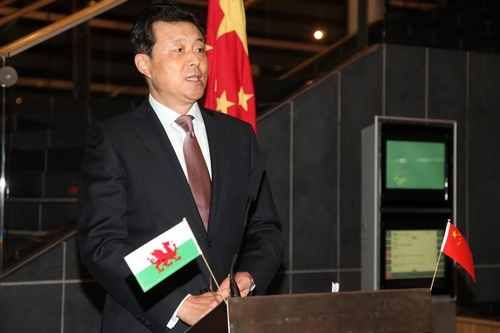 Cooperation between Wales and Chinese local authorities provides a compelling example. In 1983 Cardiff and Xiamen became friendship cities. They were the first pair of its kind between China and UK. Recent years saw pioneering and fruitful cooperation between Wales and Chongqing as well as other Chinese cities. Such cooperation covered a wide range of areas, such as trade, culture, education and medical care. I can give you two examples. 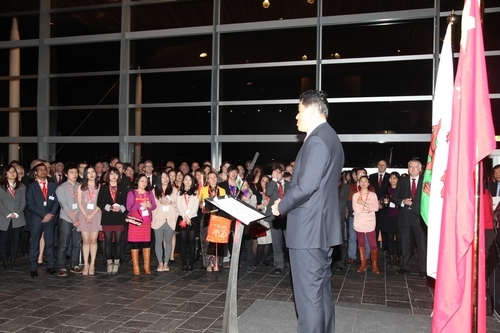 Last year Wales successfully held in Chongqing the 6th Wales Week. Also last year the China tour of the BBC National Orchestra of Wales was a huge success. 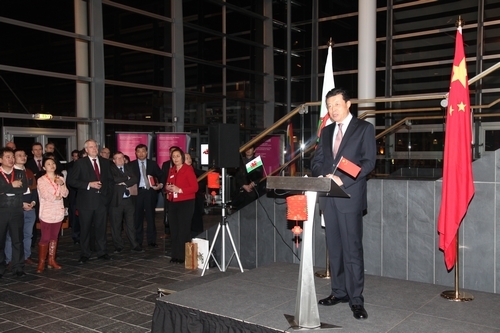 Looking forward to the new year, cooperation between China and Wales faces new opportunities. · Adjust the economic growth model to expand consumption. · Boost development through innovation in science and technology. · Put equal emphasis on industrialisation, urbanisation, digital information and agricultural modernisation. · Protect the environment and build a beautiful China, in particular return clean air to cities. · Chinese enterprises are also stepping up efforts to go global and will scale up overseas investment. · new energy and environmental protection. Our complementarity means we enjoy immense potential and ample space for cooperation. Two years ago, I was here watching the Ryder Cup. That was a very spectacular sports event. But I must say that before coming to Britain, the Welsh sports I heard most was Welsh rugby. Since my arrival in UK, I have received invitations to rugby games from many Welsh friends. But it is a pity that I never made it due to scheduling reasons. I have learned that this Saturday Welsh rugby team will fight the National Team of France. This will be a tough battle. You may know this Saturday is the very eve of the Chinese New Year. I hope this auspicious and happy day will bring good luck to Welsh rugby team. I will be waiting for your good news!